We had hoped for some water fun for the Memorial Day weekend, and well...we got some (and it wasn't just the rain). I went shopping for a little while Saturday morning and while I was gone, Phillip had taken the boys outside to play. While out there, he got the idea to zip tie the water hose to the fence behind the regular slide and then zip tie the nozzle to where it would constantly put out a mist of water. He then put a tarp under the slide to keep the boys from landing in the mud, and it also gave them a little more room to slide. This was too funny not to video and I wanted to share it. Lately, Carson LOVES to sing (or scream - whatever you want to call it). His favorite is the Lord's Army. However, he also loves to sing the ABC song, Jesus Loves Me, Jesus Loves the Little Children, and My God is So Big, among many others. Below are a couple of videos of him singing. You'll notice he has a really southern accent! You'll also see Hayden running around in the background. I think he likes to sing too, he is just a bit more shy about it (like his mommy). Hello everyone! We are still here - just busy as usual. I took the day off today (Phillip and I went to a concert last night) and decided to spend some of the boys' naptime blogging. I feel really bad that there are no pictures up since Halloween, but the wait is over :). We had a really good Christmas this year. The boys are now old enough to know a little bit about what is going on. They know who Santa is and that he brings presents - and that he also might come back and take them away if they aren't good - I hate to threaten them, but it actually does work sometimes :). They had a blast opening presents. The BIG (in size) present this year was a Castle Jumper. The boys have SOOO much energy these days that we wanted a way for them to be able to get it out. The jumper is like a mini trampoline that you blow up. We didn't realize how big it was going to be until we set it up. As you will see, it took up a lot of space. It has since come down and last year's slide has come back inside to get that energy out. However, the Castle will definitely be fun outside! The BIG (in meaning) present for the boys this year was the "bunny suit." Here is a little background: Before the boys were born I went to the Mothers of Multiples Sale and there were 2 Ty Beanie Baby bears wearing pajamas with a hood and ears - like a bunny. Carson took up with these "bunny bears" very quickly and wouldn't go anywhere without one. When he was old enough to figure it out, he started taking the suits off and just carrying them around - the "bunny suit." Well, as luck would have it, we lost not only one of the suits, but both of them (one in the Mall and one at Wal-Mart). He was sad about this, but we figured he would get over it and decided to hold off getting him a new one. Well, months later he would still mention the bunny suit - he wasn't upset - he just wanted it back. So, we told him that Santa would try to find one. Hayden decided he wanted one too. Through a lot of searching and some interesting turns of events, we ended up with 2 bunny suits to give them for Christmas. Below are videos of them opening the suits. Just to warn you, the second one is pretty long because I started taping Carson again. They were so excited! Here are a few more pictures from Christmas. Gran & Pops bought the boys new rain coats, which they loved. They also got snow suits from Goodmommy and Gooddaddy, again, a hit. The boys really enjoyed this Christmas - and we enjoyed sharing it with them. We look forward to many more to come with them! I apologize (again) for it being almost 2 MONTHS since I've posted anything. I don't know where the time goes, but it goes. Anyway, at least you can count on me for the various holidays :). 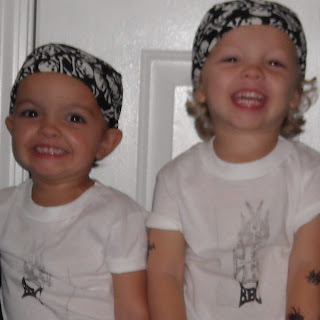 For Halloween this year, the boys dressed up as "biker dudes." We thought they were adorable (what else would we think :)). Phillip and I attempted to stick with the theme. I even got a tattoo (fake one, of course). The funny thing was, the boys and I had our fake tattoos showing, but Phillip (the one with real tattoos), didn't show his off. We had a great Halloween this year. I think the boys really enjoyed it. This morning, they grabbed their buckets and said, "go get more candy." It was so cute. Hopefully they'll forget about candy pretty soon :). 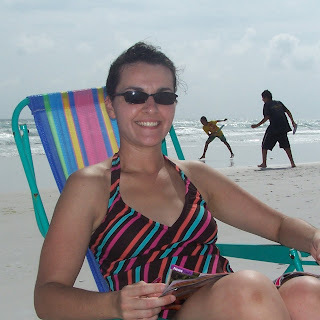 The day after Labor Day, my friend, Mica, and I headed for Destin, FL, for a nice couple of days on the beach. We had watched Hurricane Gustav in the several days leading up to Tuesday, and saw the bad storms that were still lingering from it. 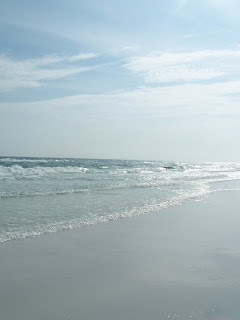 We knew that if we could just get to Destin, we would be fine. So, instead of travelling the common route to Jackson, MS, through Mobile, AL, and on into the Florida Panhandle, we went over to Birmingham, AL, and down through Montgomery and entered Florida from that direction. It took a little bit longer, but it was well worth it because we only saw on a few sprinkles of rain (for like maybe a minute), and no storms. When we got to our final destination, we got word that Mica's grandmother had passed away. We were not sure exactly what to do, but knew we couldn't turn around and go back home right then (it was almost midnight). After a lot of thought, Mica decided to stay in Destin on Wednesday and then head home to make it to the visitation Thursday night. So, we did just that. 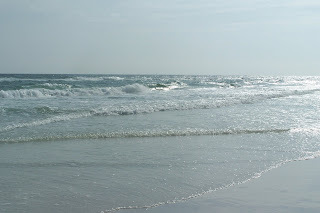 Below are some pictures from our day at the beach. 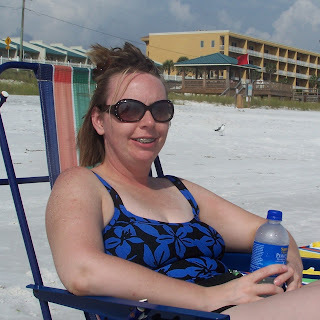 Although we didn't stay long, I think we made the most of it - especially when it came to getting some sun because we both got sunburned (and, yes, we were wearing sunscreen - apparently not enough, though). 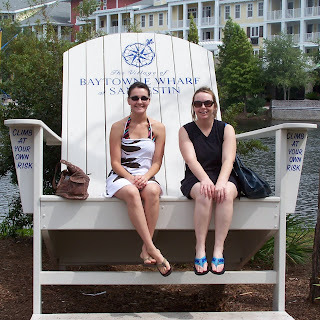 First, we drove to a place called Baytown Wharf in SanDestin. 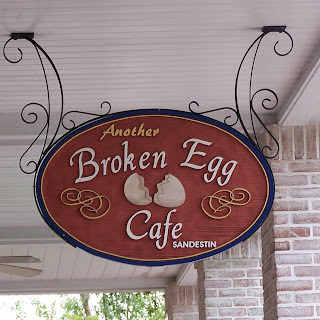 We had heard that there was a good place to eat breakfast called Another Broken Egg. We each ordered a single pancake because we figured it would be big enough (plus we were trying to not overeat as usually happens on vacation) and boy were we right. 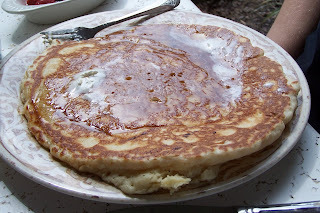 See pancake picture below. One pancake is enough for 2 people! Although we couldn't eat it all, it was very good! After breakfast, we headed to the beach. It was SOOOOO nice! It was a little cloudy, so it wasn't terribly hot most of the time. 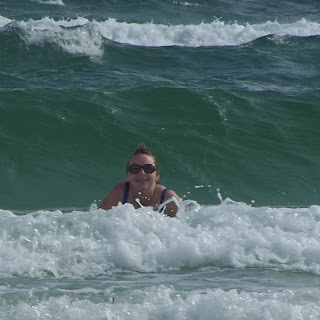 The water was up, so there was a great deal of shallow water, and there were lots of waves. It was pretty much perfect. Here are some pics. Here is a picture of Mica boogy-boarding. Go Mica! "Momma, blow eyes" Hayden notices when his nose is running and wants me to help him blow it. Well, the other day, he had been crying and his eyes were running and he wanted me to "blow his eyes." It was so sweet and funny! "Momma, light bug me" Carson had hurt himself the other day and I picked him up to kiss it and make it better. I held him like a baby to see if he would let me (gotta try sometimes :)), and apparently the light was in his eyes and he wanted me to turn it off. Not sure how he picked up "bug me," but I'm sure it was from us :). "Bit Burp" Bit is Hayden's (and therefore Carson's) way of saying "Puppy," who we would have a hard time without. We were on our way home from church and Hayden started laughing and looking at Puppy. I asked what was funny and he said, "Bit Burp." I said, "did Puppy burp," and he said "uh huh." Their imaginations are amazing! As I get more, I will post them.